I was away from home for over a year dealing with family matters, including the death of my Mother. I have done very little writing in that time but I always have a variety of topics in mind, in various stages of completion. I’m excited to get back to genealogy and writing. A recent interest in orphan train research led to an accumulation of documents from two children’s homes. I am transcribing them but I have yet to decide the best option for making them available. I also have a variety of family stories in various stages, from notes from family members to first drafts. My family expects me to write “the book” meaning a sort of compiled genealogy including all of the many stories we have learned. This is the year for that project. I have written many article and reports, but my favorite genre is simply writing the stories. I prefer to focus on them. Putting them in a historical context is exciting. People, especially one’s own family, make history come alive. Every family has amazing stories to share, but they are often unaware of them. I recently worked on a project that included a sheriff involved in politics accused of murder, a moonshiner (alleged), mysterious deaths, and a connection to President Jimmy Carter through a Revolutionary War soldier. What great material for stories! I write from a love of family and history. When I stand on those hills pictured on my blog, at the Cumberland Gap, or the land where the old Eastham home was in Boyd County, Kentucky, I see the people who came before me. I want others, especially my family to see them too. There are many stories to write, but so many have been lost. We need to find and preserve all that we can. The process depends on the type of writing I’m doing, but research is key. Often, I will admit, perhaps too much. Each new topic requires new books, both purchased and from a library, and hours of Internet searches. The family stories require research as much as any other topic. I often have ideas while driving or gardening etc. I try to make notes of any ideas that come to me before they are forgotten. As a result I have scraps of bills, napkins, etc. with wonderful ideas! I don’t use outlines or forms as I write. Of course, if I am writing about a topic like land records or migration routes, I have a basic list of points I need to male in my head. Sometimes a phrase comes to mind and gets me going. I love the rhythm of words and the cadence of phrases, and their ability to evoke emotion. Now I want to introduce two writers to you. One lives in Oregon, the other in North Carolina. Susan and I were editors for a number of years in addition to our other genealogical activities. I met Lisa through ProGen, a networking opportunity as well as a great educational venue. 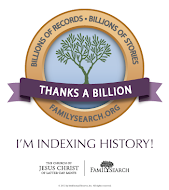 Susan LeBlanc, an Accredited Genealogist, began researching her family history over forty years ago. Susan graduated from Brigham Young University with a Bachelor of General Studies degree with a focus in Family History. Working to create accurate and complete family histories is one of her specialties. She enjoys helping others research, lecturing, teaching classes and translation work in Italian, Portuguese, and Spanish. Her husband, six children and five grandchildren have patiently supported her in these pursuits. Susan blogs at Gopher Genealogy. Lisa Lisson is a genealogist, blogger and etsyprenuer. She specializes in North Carolina and southern Virginia research. For the past five years, Lisa has been blogging about her genealogical adventures at Are You My Cousin?. As another way to share family history Lisa also creates custom photo jewelry featuring a customer’s own photographs in her online Etsy shop Esther’s Place. Recently, Lisa’s blog and shop moved to www.LisaLisson.com.